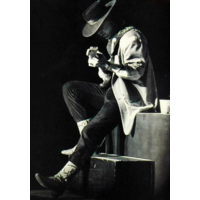 Stephen "Stevie" Ray Vaughan (October 3, 1954 – August 27, 1990) was an American blues guitarist. Born in Dallas, Vaughan moved to Austin at the age of 17. He began his career there when in 1983, record producer John H. Hammond arranged him a deal with Epic Records. Accompanied by bassist Tommy Shannon and drummer Chris Layton as Double Trouble, Vaughan was an important figure in Texas blues, a loud, swing-driven fusion of blues and rock. He became the leading musician of the blues rock sound with a series of network television appearances and charting albums. Vaughan's debut Texas Flood, released in June 1983, became a double-platinum record. Alcohol and drug abuse severely affected his health, though he became sober in late 1986. After three years without a new album, he returned to the studio, which led to the release of In Step. The album produced the single "Crossfire" in July 1989, which became a number one hit. In 1990, Vaughan performed a concert at Alpine Valley Music Theatre before an audience of approximately 25,000. He died suddenly in a helicopter accident afterward, crashing into a nearby ski slope. Vaughan had unusually wide success encompassing several styles such as jazz and ballads. Nominated for 13 Grammys, he won four during his lifetime and posthumously. He won two Blues Music Awards and was inducted into the Blues Hall of Fame in 2000.